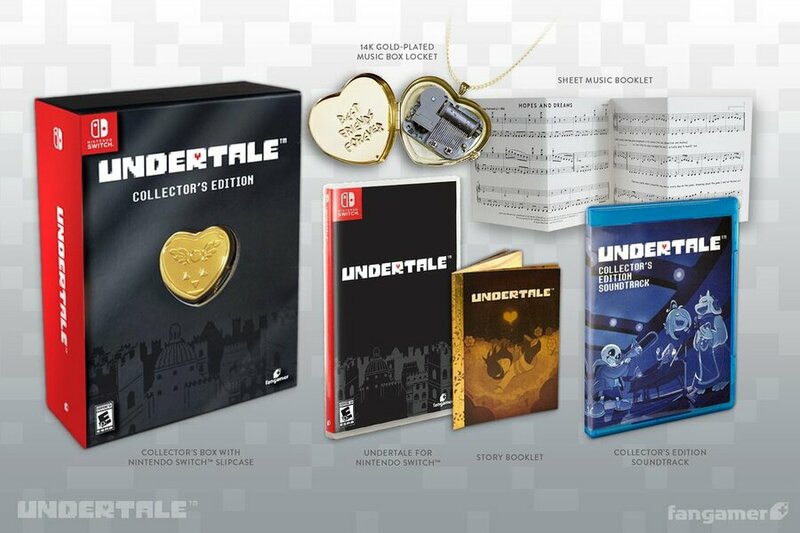 A couple of weeks ago, news broke that Undertale would be hitting Japanese shelves this September, alongside a lovely Collector's Edition for good measure. It has now been confirmed that western territories will also be getting the game, and its additional box of goodies, in the same month. On top of all this, Fangamer is also selling a range of Undertale merchandise for your consideration. If you're interested, you can check out all of the products here - you have until 28th August to snap up your favourites. Obviously you can download the game on release, but if you wanted to pre-order the physical collector's edition, do it here on Fangamer. Have you been waiting to get your hands on Undertale on Nintendo Switch? Are you tempted by this Collector's Edition? Tell us in the comments below. I would buy this if I owned a Switch. Well that settles it, pre-ordering. The collector's edition is too pricy for my liking. I'll likely grab the regular physical copy over digital though. Now you can spend $70 on a $10 game! Is there just a standard physical edition without a billion extras? EDIT: My bad for not reading the article first. Aliexpress' music box adds at least 20$ of a value, feel hopes & dreams of China. It would be nice to get all these extras, especially the sheet music, but I don’t want to pay $70 for a $10 game. Collector's edition also coming to Europe? No need to import it then. I'll check the price in euros and decide. I'll pass on SNK 40th Anniversary Collection's Collector's Edition, though, because it's 78 euros with shipping. If only it was available on Amazon... it would cost a lot less by taking the shipping out. So I hope Undertale can be bought on that or other stores too. @LegendOfPokemon will it cost 10$ in the eShop? Is it confirmed? I've owned Undertale on the PS4 for months and have yet to work up the mood to actually play it, but this is pretty sweet. That's disappointing that I won't be able to just walk into GameStop or Best Buy and buy it guess I will just have to look into ordering it from Fangamer or just buy the digital version. Never got around giving this game a try. But people talk so much about it that i might do it someday. Been wanting to see what all the fuss is about, so I'll download this game when it comes out. Still waiting for release dates on Hyper Light Drifter and Mark of the Ninja. @Navitroid Not to mention the game takes advantage of being on a PC. I don't want to go into spoilers, but the PS4 isn't able to do the same thing the PC version does when fighting a certain boss. At least there are trophies in the PS4, but a lot of them are relegated to an exclusive secret area that is dedicated to wasting the player's time. The Switch version is at least portable, but then so is a small laptop, and like you said, even a crappy PC could probably run this game. So digital comes with disposable game data that may or may not be there when the servers go down. Physical comes with 14k gold. It's currently on sale at GOG for $5. I think I'll go with that. I had to order the special edition for my daughter. Her and her friends have been obsessed with this game for a long time now. It's going to be a Christmas present. @thesilverbrick Congrats on not managing to read past the first paragraph. I've never played the game. To be on the safe side, I think I'll stick with the standard edition this time around. @LinkSword Congrats on being condescending. You should get one. Just the ability to remove it from its post and take it to the bathroom immediately causes the system to pay for itself. Anyway, I beat this game on Steam. Think that I will do a full-kill run on Steam, then do a no-kill run on Switch. A crappy PC can definitely run it. I have a crappy PC (or at least low-spec), and it runs Undertale flawlessly. That said, Undertale on Switch is a no-brainer. Games are generally more fun on Switch, at least from my experience. A PC or labtop doesn't have the aesthetic flexibility and convenience of the world's first true hybrid console. @Grauz I don’t know what it will be on the eShop but it’s $10 on Steam, so I assume the eShop price will be the same. I completely forgot about this game. I've always wanted to play this game, but knowing you can get it so cheap on steam i'll wait til it's cheap on switch if i pick it up there. Even though I've never played the game... I'll bite. I'm such a sucker for these. Pre-ordered. Look Ryan. I love you, but you can just poke into threads and say hello. No need to be afraid. We won't bite. Think I'll buy digitally as it seems the price will be a lot less and I'm not too sure if I'll like the game. The collectors edition for look good though I must say. I've listened to a lot of the music and it's really good. I'm really surprised by the fact there's an actual sheet music booklet. Not a lot of game companies do that! I know he's a freelance game developer, but this is a huge unexplored area that companies could profit off of. Good for this developer for making a successful game that can warrant a cool and enticing collector’s edition! This actually looks like one I’d want, but I’m really just too cheap. I had the regular PS4 version from Fangamer. Wish they would sell the necklace separate. That's the only thing out of the CE that I really want. @Deadlyblack You do realize that is where the majority of the cost for the CE comes from right? Don't know why either Switch version needs the $5 extra fee but ok.